Welcome to Episode 85 of the 1% Better Podcast. 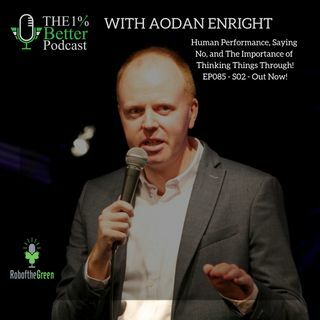 I’m very much delighted to introduce Aodan Enright as my guest for this episode. Aodan is someone I’ve taken inspiration from, admired and enjoyed getting to know over the last couple of years and was someone I’ve wanted to have on to the show from the very start. Now it's a reality. We both share a fascination for human performance and this conversation certainly lived up to my hopes and expectations. Aodan is ... Más informaciones the Founder of Smarter Egg, where he works to help people: organisations, business owners, self-employed, high-calibre professionals. He’s an Executive Coach and works one-to-one with clients. Aodan also gives talks, plays the role of MC/Interview for events and runs events himself that align to his passion for personal development. During this interview, we cover a lot of ground and it has lots of useful and practical insights that you can use. So I would recommend getting a pen and paper out and taking notes! Active learning required. Below is a summary questions and answers as well as timings. Expect to see more and more Aodan out and about more in the coming weeks and month. My asks to you – enjoy, learn, take action, and share this with others. 3min – Working with the inner voice – the best approach to fight with it? 6mins – Getting more and more interested in Things! 7mins – The Arsenal Affliction and Good times! 10mins – Working in the Engineering Initially and having no plan! 16 mins – Getting to know Thyself – Focusing more on why people behave the way they do! 19 mins – Pull & Push Factors as a turning point in making to the move to go solo! 23 mins – Returning to the Voice in the Head in the early days! 28 mins – The Curse of Knowledge with opening up and reflecting!!!!! 30 mins – Understanding what to focus on next! 32 mins – The Ego of saying Yes and developing the ability to say No! You’re better off going with someone else! 34 mins – Smarter Egg, the beginnings, the concept and how it’s grown. 41 mins – Feeling & Intuition – Trusting the Gut – Pay attention of what’s screaming to you! 46 mins – Knowing when to delegate now – getting better at this! Courage needed here. 47 mins – A role that gives the greatest joy – designing and delivery of the solution. 49 mins – Do the same talk twice and the value of this. Anchor Problem – Holding you down!